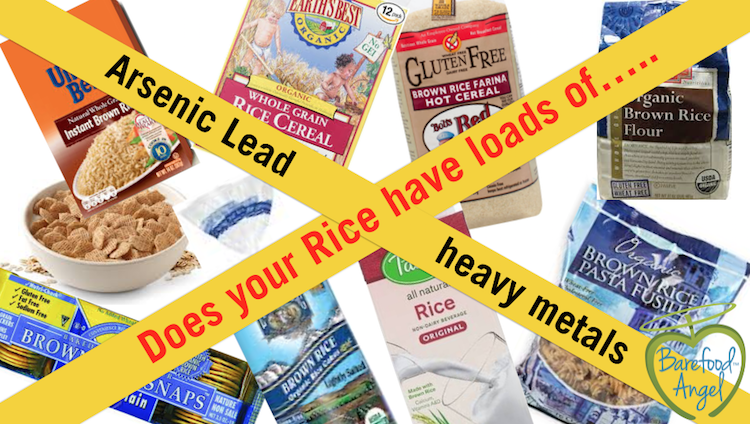 Does your Rice have Arsenic, Lead and other Heavy Metals? Rice is a good source of complex carbohydrates (the right quality of carbs) needed by your body. However, so many rice products are contaminated with arsenic as a result of modern agriculture. Besides rice itself, brown rice could be found in instant cereal, protein powders, hot cereal, rice cakes, crackers, rice pasta, rice flour, rice drinks, rice syrup and rice vinegar. In many places around the world, soil has been contaminated with arsenic as a result of arsenic-containing pesticides and fertilizers. And because rice grows in water-saturated soil, it absorbs about 10 times more arsenic than other grains. Brown rice contains 80% more arsenic on average than white rice because arsenic accumulates in the grains outer layer which is removed to make the white rice. Brown rice in particular is contaminated with toxic lead, cadmium and tungsten. Organic rice is just as susceptible to absorbing the chemical as nonorganic varieties. But scientists warn of complacency. “We already know that high concentrations of arsenic in drinking water result in the highest known toxic substance disease risks from any environmental exposure,” says Allan Smith, M.D., Ph.D., a professor of epidemiology at the University of California, Berkeley. “So we should not be arguing to wait for years until we have results of epidemiologic studies at lower arsenic intake, such as from rice consumption, to take action.” His studies of arsenic in public water in Chile and Argentina helped show that it causes lung and bladder cancer and other diseases. The FDA has been evaluating inorganic arsenic levels (the kind considered to be a cancer-causing carcinogen) in rice for over 20 years. Inorganic arsenic is considered to be a Group 1 carcinogen by the International Agency for Research on Cancer. It’s known to cause bladder, lung and skin cancers – targeting the liver, kidney and prostate. Nearly half of the 1.6 million tons of arsenic used for agricultural and industrial purposes in the U.S. has been used from the mid-1960s to today, according to the federal Agency for Toxic Substances and Disease Registry. So, for those who say “people have been eating rice for hundreds of years without the fear of arsenic toxicity,” – you’re right. But, we’ve been dumping a significantly larger amount of arsenic into our soil in just over the last 50 years – more than ever before. Residues from decades of use of lead-arsenate insecticides linger in agricultural soil today, even though their use was banned in the 1980s. In animal feed, to prevent disease and promote growth, other arsenical ingredients are still permitted. Moreover, fertilizer made from poultry waste can also contaminate crops with inorganic arsenic. 2012 Consumer Reports reported results of tests of rice and rice products. It is a spot check and too limited to offer general conclusions about arsenic level in specific brands or within/across rice product categories. 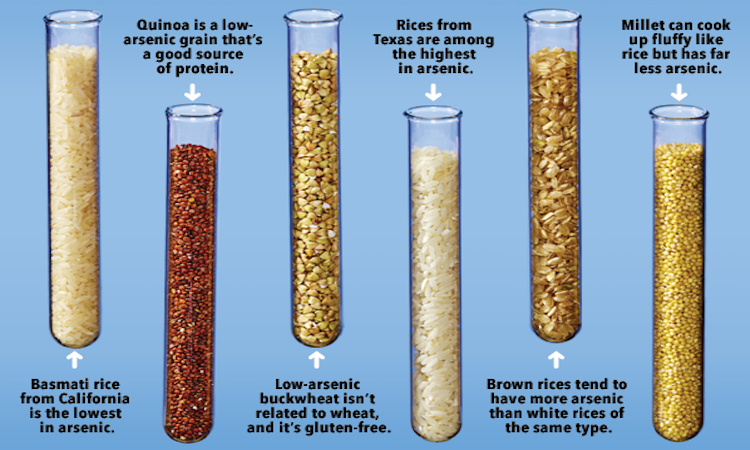 The Food and Drug Administration (FDA) has yet to put limits on arsenic levels in rice. But the Environmental Protection Agency (EPA) has set a limit of 10 parts per billion (ppb) as the threshold for arsenic in drinking water. It is the equivalent of 10 drops of water in a swimming pool. In 2012 researchers at Dartmouth tested products containing organic brown-rice syrup (including toddler formula and energy bars) and found that many contained surprisingly high levels. One formula had six times the EPS’s drinking water limits. Mike Adams from Natural News has been conducting extensive research using atomic spectroscopy instrumentation at Natural News Forensic Food Labs to expose toxic heavy metals in protein powders. Our world is more toxic than the one our pre industrial age ancestors lived in. The solution isn’t to give up, either by not caring about what we consume because it is too overwhelming or by thinking that there is nothing left to eat. As always I believe we have plenty of options. Drinking clean pure water. My next set of articles that I am finishing up is going to be ALL about water. Water is such an overlooked essential nutrient. Not all water is created equal and most are full of toxic chemicals and heavy metals. I will show you soon how to hydrate properly with clean pure drinking water. Limit your total carbohydrate calories to about 25 percent oftotal daily intake, and your protein to about 15 percent, with the additional 60 percent coming from healthful fats like butter, egg yolks, avocados, coconut oil, nuts and animal fat. Listen to YOUR body to adjust accordingly. Change the way you cook rice. You may be able to cut your exposure to inorganic arsenic in rice by rinsing raw rice thoroughly before cooking, using a ratio of 6 cups water to 1 cup rice for cooking and draining the excess water afterward. That is a traditional method of cooking rice in Asia. The modern technique of cooking rice in water that is entirely absorbed by the grains has been promoted because it allows rice to retain more of its vitamins and other nutrients. But even though you may sacrifice some of rice’s nutritional value, research has shown that rinsing and using more water removes about 30 percent of the rice’s inorganic arsenic content. Diversify your complex carbohydrates. Eat low arsenic options like organic potatoes and quinoa. Instead of rice milk, drink almond milk. Better yet, make your own. Use coconut sugar and maple syrup instead of brown rice syrup. If eating rice pasta, I recommend AnnieChun’s Pad Thai Rice Noodle (not the brown rice kind of course). This brand tastes great, doesn’t becoming sticky like brown rice pasta and cooks quickly. Limit consuming rice pasta to no more than once a week. If eating rice, choose certified organic white basmati rice grown in California, India and Pakistan. According to Consumer Reports rice from these areas have significantly lower levels of arsenic than rice grown in other parts of the United States and the world.